From the editor of the widely praised The Landmark Thucydides and The Landmark Herodotus, here is a new edition of Xenophon’s Hellenika, the primary source for the events of the final seven years and aftermath of the Peloponnesian War. Hellenika covers the years between 411 and 362 B.C.E., a particularly dramatic period during which the alliances among Athens, Sparta, Thebes, and Persia were in constant flux. Together with the volumes of Herodotus and Thucydides, it completes an ancient narrative of the military and political history of classical Greece. Xenophon was an Athenian who participated in the expedition of Cyrus the Younger against Cyrus’ brother, the Perisan King Artaxerces II. Later Xenophon joined the Spartan army and hence was exiled from Athens. In addition to the Hellenika, a number of his essays have survived, including one on his memories of his teacher, Socrates. Beautifully illustrated, heavily annotated, and filled with detailed, clear maps, this edition gives us a new, authoritative, and completely accessible translation by John Marincola, an comprehensive introduction by David Thomas, sixteen appendices written by leading classics scholars, and an extensive timeline/chronology to clarify this otherwise confusing period. Unlike any other edition of the Hellenika, it also includes the relevant texts of Diodorus Siculus and the Oxyrhynchus Historian, with explanatory footnotes and a table that correlates passages of the three works, which is perhaps crucial to an assessment of Xenophon’s reliability and quality as a historian. 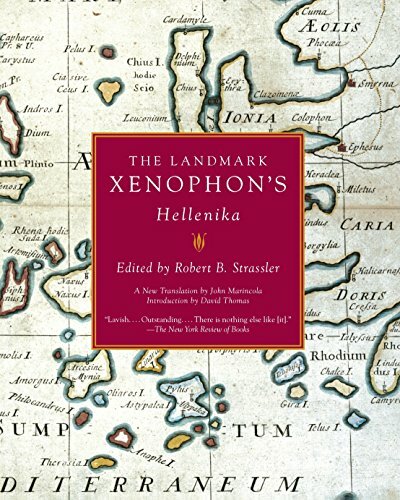 Like the two Landmark editions that precede it, The Landmark Xenophon’s Hellenika is the most readable and comprehensive edition available of an essential history.